There will be a new batch of amulet by Kruba Oar that will be release soon. 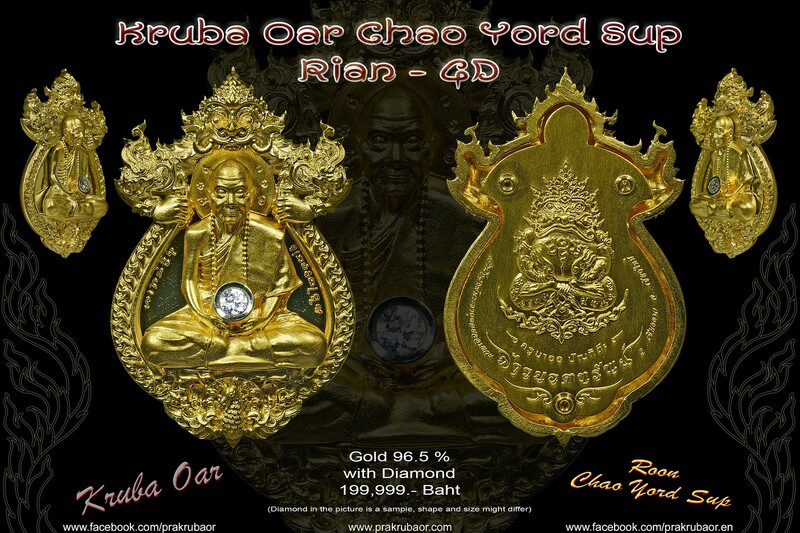 This batch of amulet is a rian called roon "Chao Yord Sup". The ceremony will be held at Wat Phra Tad Doi Chom Wea on 27 July 2015. Kruba Oar will bless this batch of amulets for 3 days and 3 nights prior to the ceremony. 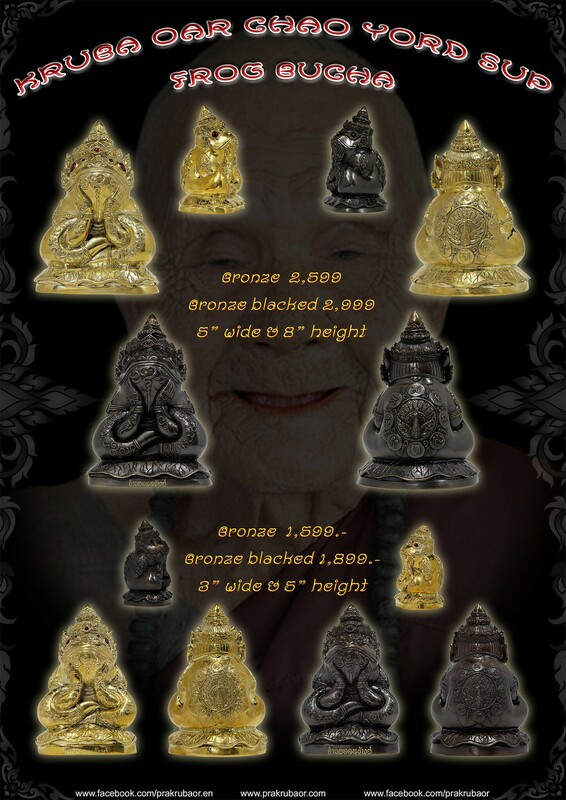 The purpose for the release of this batch of amulet is to raise funds for the temple. Currently the temple is short of funds and was unable to pay for electricity for many months. From the funds collected, the project team hope to be able to install a power generator for the temple. The pre-order will take place soon and all support will be very much appreciated. You can find out more from the following links. 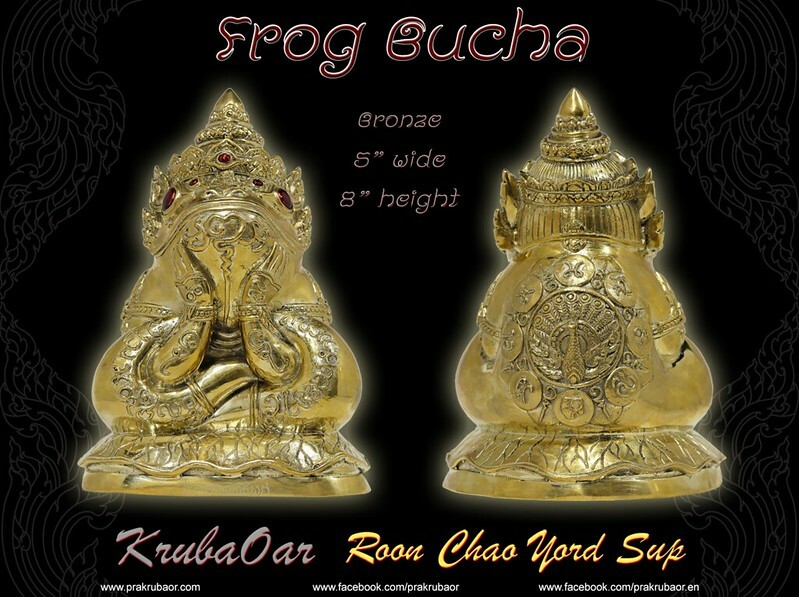 Frog "Chao Yord Sup" by Kruba Oar Wat Phra Tad Doi Chom Wea. After several days of casting the 4D design, today we can finally see the first sample of the bucha "Chao Yord Sup" (Side view). 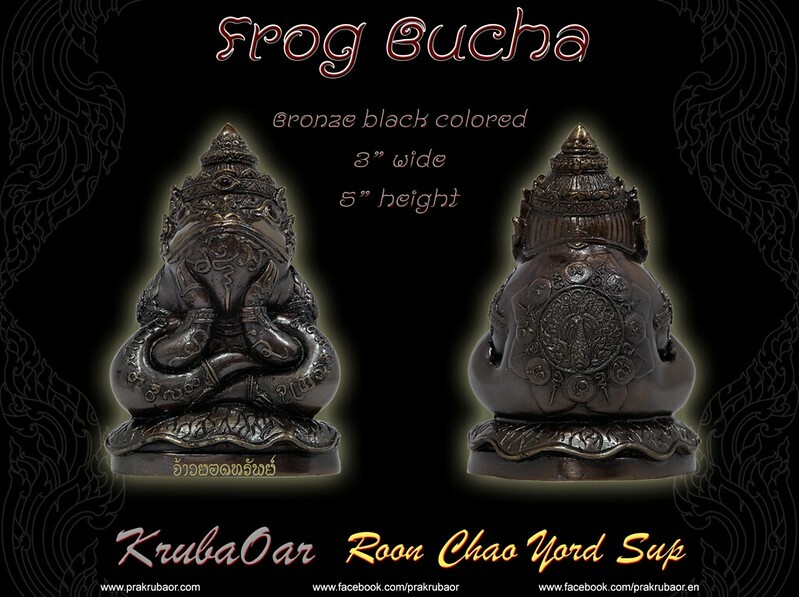 This is one of the several holy items of "Chao Yord Sup" by Kruba Oar. Come admire the bucha. Views from other angle will be available very soon. There will be 3 sizes for this bucha. Please help Kruba Oar and show your support by liking us on facebook. Thank you very much. The pre-order starts 29 May 2015 and order form will be made available soon. All support will be very much appreciated. Roon "Chao Yord Sup" by Kruba Oar Wat Phra Tad Doi Chom Wea. Pre-Order Form in English is available now. Please download the PDF file at the given link below. All items are quoted in Thai Baht, but other currency will be accepted as well, for exchange rate please contact us. Currently only the Frog and Taoleed Version have sample pictures for reference. The sample pictures for the rian and the powder items will be made available shortly. 1. Enter the quantity you want to order for each item. Total amount of each item and grand total will be calculated automatically. 2. Enter your contact information at the end. 3. Send the PDF file to one of the below mention Admin. Once order is received, one of the Admin will contact you for further instructions. Once the Payment is received, the order form will be sent back with an Order Number filled in on the top. In general, only bank transfer will be accepted to guarantee proof of order and payment. Order form and bank transfer slip need to be provided for proof by the customer during collection. 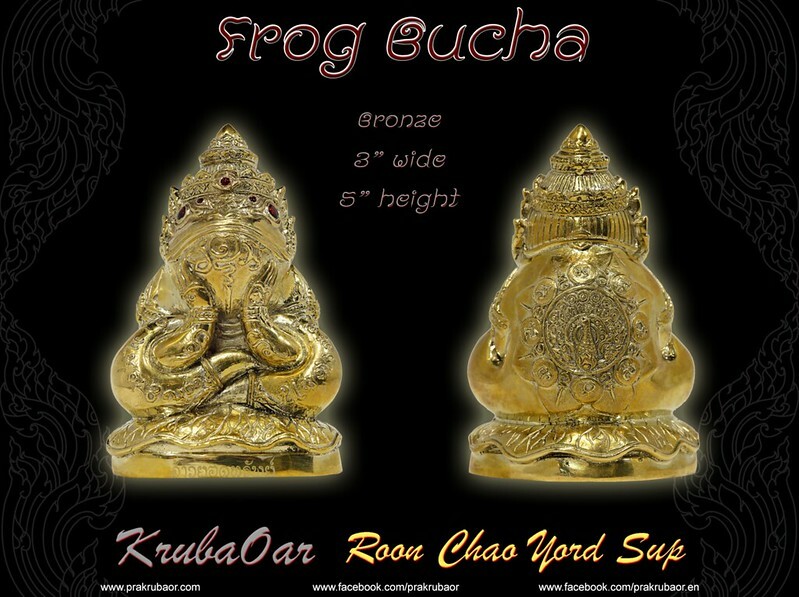 Amulet Roon "Chao Yord Sup" by Kruba Oar Wat Phra Tad Doi Chom Wea. 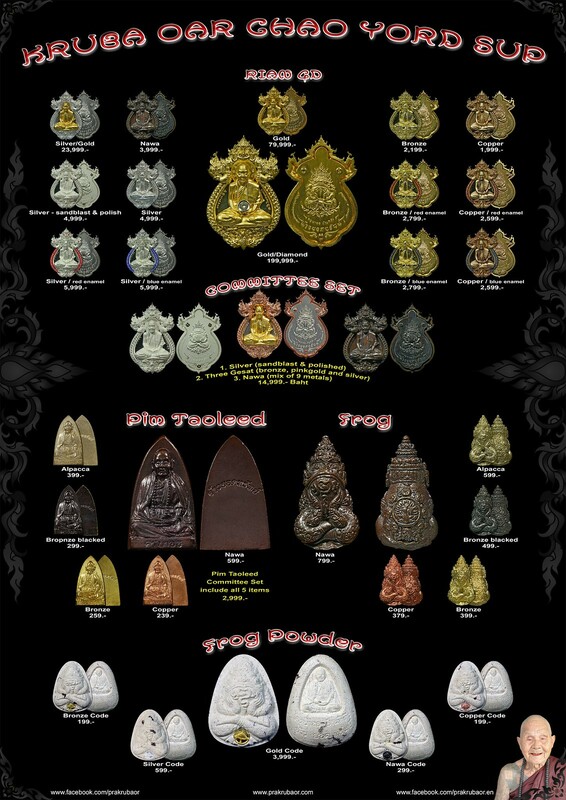 *Frog Powder with Gold Code Sold-out! All items are quoted in Thai Baht, but other currency will be accepted as well. Please contact us for exchange rate to use. 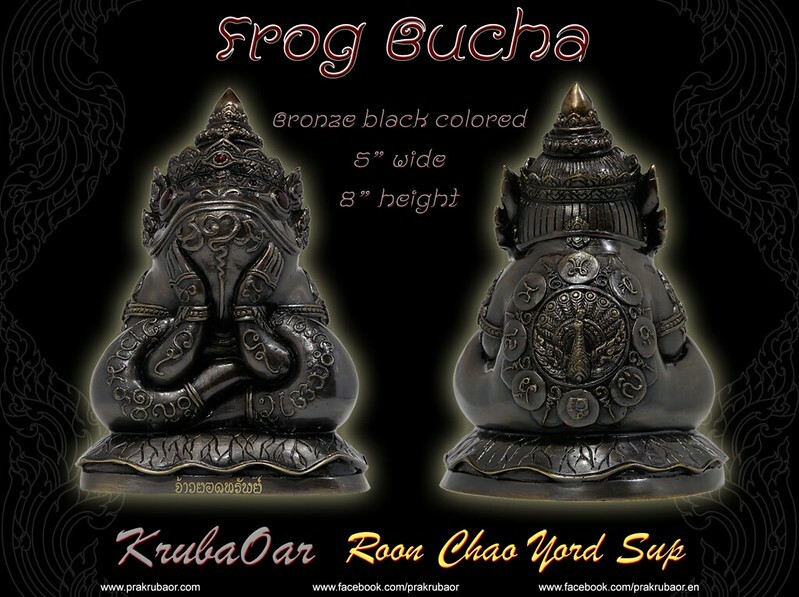 Bucha Roon "Chao Yord Sup" by Kruba Oar Wat Phra Tad Doi Chom Wea. *Free shipping to Singapore on first come first serve basis. Offer ends once I hit 20kg worth of order. WIN A 199,999 BAHT RIAN!!! *Rian 4D Committee Set Sold-Out!